A huge part of our economy is invisible, invaluable, and under siege. This is “the commons,” a term that denotes everything we share. Some parts of the commons are gifts of nature: the air and oceans, the web of species, wilderness, and watersheds. Others are the product of human creativity and endeavor: sidewalks and public spaces, the Internet, our languages, cultures, and technologies. 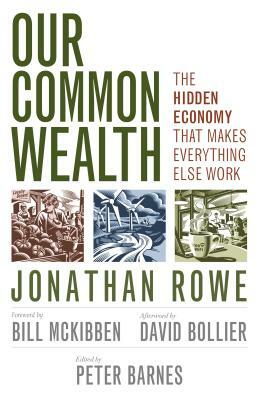 Jonathan Rowe illuminates the scale and value of the commons, its symbiotic relationship with the rest of our economy, its importance to our personal and planetary well-being, and how it is threatened by privatization and neglect. He unifies many seemingly disparate struggles—against pollution, excessive development, corporate marketing to children, and more—with the force of this powerful idea. And he calls for new institutions that create a durable balance between the commons and the profit-seeking side of our economy. Jonathan Rowe was a Nader’s “Raider,” a US Senate aide, an editor at the Washington Monthly, and cofounder of OntheCommons.org. Peter Barnes (editor) is a cofounder of Working Assets/Credo and the author of Capitalism 3.0.